You have probably heard the phrase “people vote with their feet.” This notion certainly seems true across the United States. Historically, our country was shaped by large migrations of population, such as the Westward expansion in the early 1800s and the Great Migration (which brought factory workers from the agrarian south to the manufacturing north) in the 1900s. Today, we are experiencing an ongoing Sunbelt migration. While we don’t have a lot of data history on current shifts in population, we can still get a sense of Kansas City’s recent migration story using Internal Revenue Service data, which provides county-to-county migration data between 1994 and 2010. 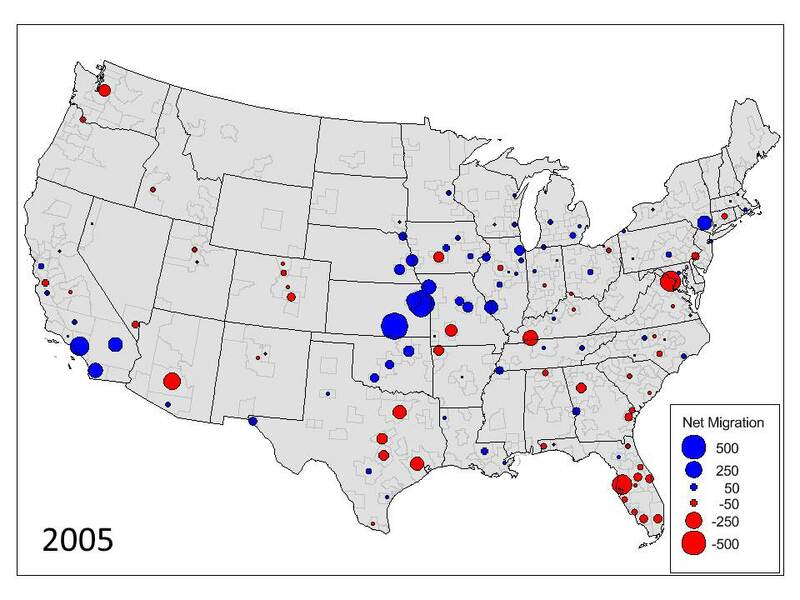 By grouping counties in the appropriate metropolitan areas, we can get a sense of where Kansas City migrants are coming from and going to over time. First, a little background information about the data. 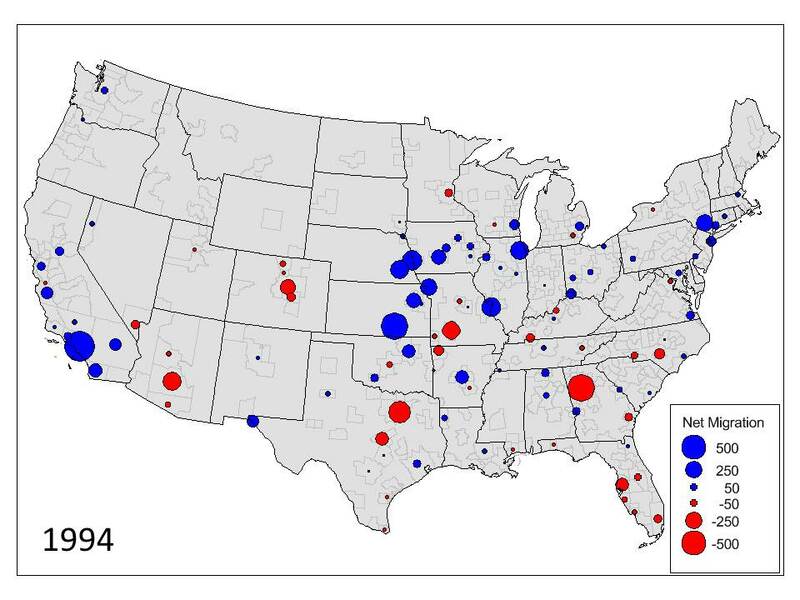 The IRS gives us county-to-county migration data only if at least 10 people moved from one county to another, so these figures will understate true migration totals — although agglomerating the county data into metropolitan areas — which generally have sufficient migration between counties for comparison — tends to minimize this shortcoming. Secondly, the maps and table below show net migration (inflow migration minus outflow migration). There may be instances where there is a great deal of movement between Kansas City and another metro, but the inflow and outflow are fairly balanced. Migration between Kansas City and Minneapolis-St. Paul is a good example. There is a great deal of overall migration activity between the two metros, but the exchange is so balanced there is little net change. In general, the pattern stays fairly consistent. Kansas City experienced net migration inflow from places like Wichita, Omaha and St. Louis pretty much throughout the 1994-2010 time period. And Dallas-Ft. Worth, Phoenix and Tampa-St. Petersburg are consistently towards the top of our largest net outflow metro areas. But there is noticeable change in the amount of migration over time. 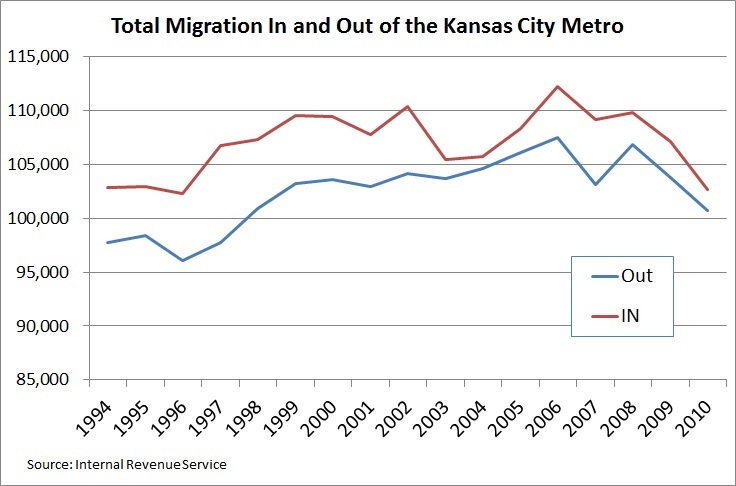 The four maps below show net migration to or from the Kansas City metro in 1994, 2000, 2005 and 2010. In 1994, the Kansas City metro drew considerably (blue bubbles indicating inflow) from other Midwest metros like Wichita, St. Louis, Omaha, St. Joseph and Topeka. The region also saw a great deal of net inflow from California metros. Net outflow (in red) is more pronounced to Atlanta, Dallas-Ft. Worth and Phoenix. In 2000, the pattern is similar. However, outflow to Atlanta appears to have slowed and inflow form California also slowed, and in some cases even reversed. Kansas City continued to draw from smaller surrounding metro areas in the Midwest. The most notable development by 2005 was the decline in inflow from some nearby metros. Kansas City did not draw as many migrants from Omaha, Lincoln or St. Louis as it did earlier. The Kansas City metro lost population to Des Moines, while it continued to draw from Lawrence and Wichita. The 2010 map (the most recent data we have) looks quite different from the original 1994 map. Kansas City’s drawing power from other smaller regional metros like Des Moines, Omaha and even Wichita appears to have declined. The draw from California metros has also dissipated. 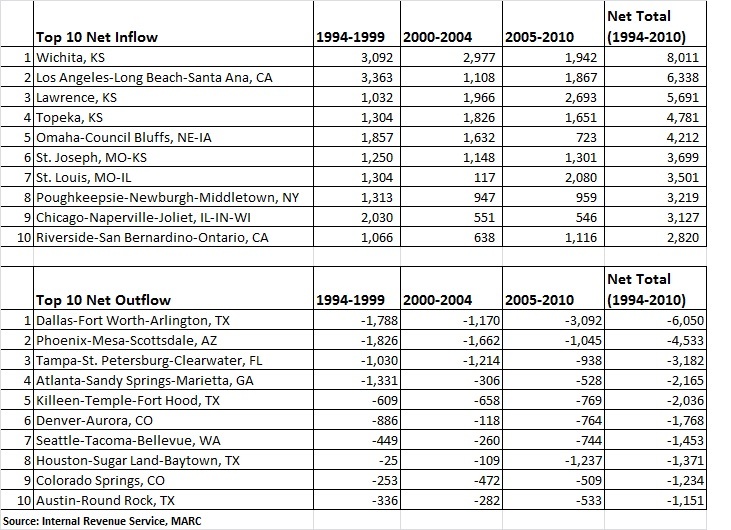 Net outflow to the Dallas-Ft. Worth area has grown and places where Kansas City once had net inflow (like Oklahoma City and Tulsa) are now net outflow areas. The table below looks at the data in another way. The top 10 inflow and outflow metro areas between 1994 and 2010 are listed by total migration. This figure is broken down in three separate timeframes: 1994–2000, 2000–2004 and 2005–2010). Even though these are uneven time periods, the data is telling. The top 10 inflow metros numbers generally decline over the three time periods (Lawrence and St. Louis are exceptions to this). On the bottom half of the table we see that outflow activity increases in most of the metros — meaning we are losing more population to these regions. As a quick aside, a couple of metros in the table stand out: Poughkeepsie, N.Y., and Killeen, Texas. The Poughkeepsie metro area is home to West Point, which sends hundreds of personnel to Fort Leavenworth every year, and Killeen is home to Fort Hood. So in both instances, it is the armed forces that are driving the anomalies in the migration patterns. One last point to make; migration activity does tend to slow during economic downturns. So overall migration activity in the 2005-2010 period is suppressed somewhat. The chart below shows a that decline in both inflow and outflow migration since 2008. This adds significance to the sizable outflow numbers to Dallas-Ft. Worth and Houston between 2005 and 2010. Despite the economic slowdown, these Texas metros were able to attract over 4,000 net migrants from the Kansas City metro. There are a lot of reasons why people relocate, but one of the biggest is to seek better economic opportunities. We know that our Kansas City economy has not performed as well some competing metros in recent years; perhaps we are beginning to see results play out in the migration data. Bottom line, we remain a net inflow metro — more people still move here than move away. But the difference is shrinking, and that’s a concern for the region.